on September 18th (Friday) and September 19th (Saturday). 333 East 47th St. between 1st & 2nd Ave. I came back to New York tonight. demonstrated a folk dance called "Nagasaki Burabura"
I am ready to go to Minnesota. the Okinawan Sanshin group there in Minnesota. on the main stage at 4:30 pm. We also will join the Bon Odori at 8:30 pm. Come and join Bon dances! Bonsai, martial arts, singing, dancing, drumming, delicious food and other aspects of Japanese culture, will be featured at the annual Como Park Japanese Lantern Lighting Festival, a family-friendly event, reminiscent of Japan’s annual Obon holiday, on Sunday, August 23, 2015 on the grounds of the Marjorie McNeely Conservatory in Como Park. The Lantern Lighting Festival encompasses Japanese tradition—through music, dance, crafts, martial arts and lanterns. The Marjorie McNeely Conservatory grounds will open at 3:00p.m., and live entertainment in the Como Ordway Memorial Japanese Garden and on the main stage will begin at 3:30p.m. Entertainment will include several taiko drumming groups, koto (Japanese sitar), shakuhachis (bamboo flutes), traditional and contemporary dance and singing. Martial arts, Ikebana (Japanese flower arranging), origami demonstrations and a host of other cultural exhibits and demonstrations will line several paths through the grounds. Japanese food and dozens of culturally-related items will be for sale. 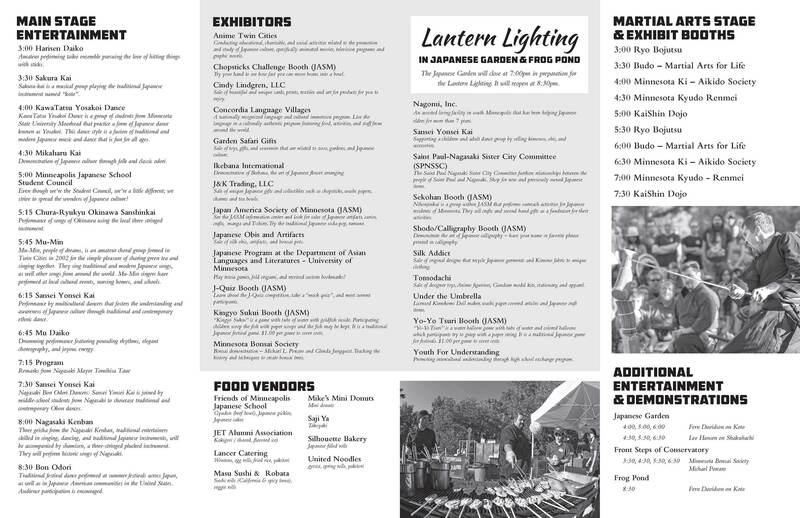 The Como Park Japanese Lantern Lighting Festival, produced by Como Park Zoo and Conservatory, Japan America Society of Minnesota, and Saint Paul Nagasaki Sister City Committee will be held on Sunday, August 23, 2015 from 3:00pm-9:00pm. Admission is $5.00 per adult (13+), $3.00 per child (ages 3-12) and Seniors (ages 65+), free for children under 3. Free shuttle bus service will be available from a staffed off-site parking lot at the District Service Center located at 1930 Como Ave.